Declaration of Result of Combined Graduate Level (Tier 1) Examination, 2016. To check cut off marks please open image in full screen. 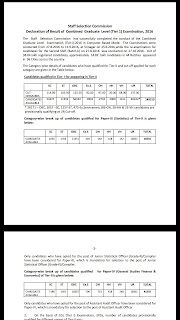 The result write up indicates that 149319 candidates have qualified for Tier-II, 28234 can appear in Paper-III (Statistics) of Tier-II, and 45293 can appear for Paper-IV (General Studies Finance & Economics) of Tier-II. Result of SSC CGL 2016 Tier 1 pre exam held from 27 August 2016 along with marks list of qualified and not qualified candidates can be viewed / downloaded here now that it has been published by the Staff Selection Commission. To check result of SSC CGL 2016 Tier 1 pre exam. 08 Nov 2016. Official website of Staff Selection Commission Combined Graduate Level Exam is ssc.nic.in. On the basis of CGL Tier I Exam candidates are provisionally qualified for Tier II computer based examination. 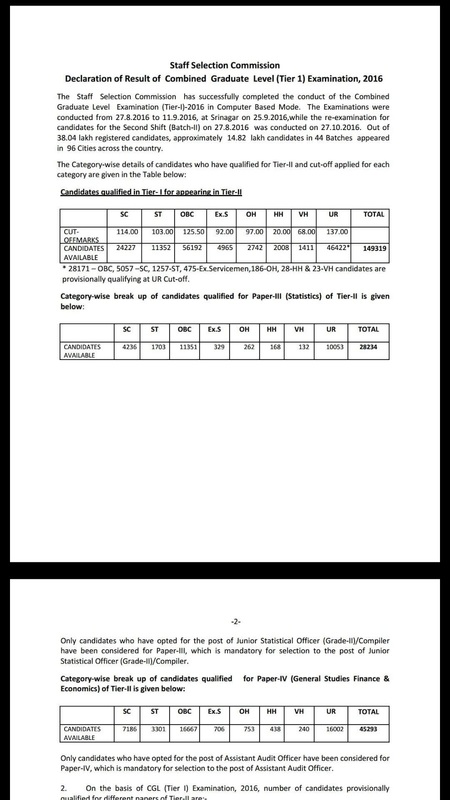 Sir SSC CGL Tier-2 Cut off list kb tak aayegi . Sir SSC CGL me kitne marks ka paper hota hai. .